This Flathead was not caught in the Philippines, but I thought it was worth mentioning. It was caught by Bill Engle last week and it weighed in at around 25lbs. He caught this beauty on a live 6” channel catfish while bottom fishing in the Susquehanna River in Pennsylvania. Too bad we don’t have this variety of catfish in the Philippines. Two day previous my brother, grandfather and I went out with Bill and caught a couple smaller fish (the largest being around 3 lbs). Too bad we were with him when he caught this monster! 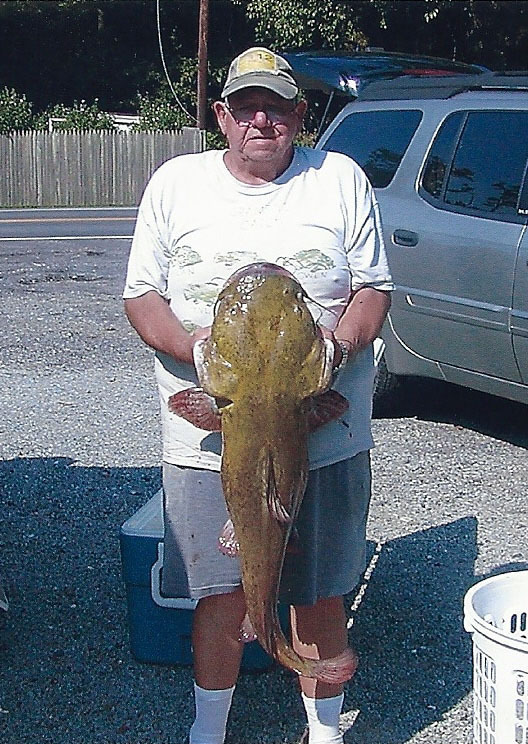 Bill received a citation from the state of PA when he went to get an official weigh-in for catching one of the largest Flatheads from the Susquehanna. He will receive a special patch to put on his hat the says “25lb’ers Club” 🙂 I hope we can do something similar in Cebu and have official fish weighing stations were sport anglers can weigh big fish. Maybe a goal for me to shoot for:-) Good going Bill! Posted on August 30, 2012, in Catfish (Hito). Bookmark the permalink. Leave a comment.